Big Bend National Park Hiking Trails. You can navigate hiking trails for Big Bend National Park either by using the map below, or selecting trails based on difficulty level below the map. Of course, the trails we have listed above don’t even come close to all of the hiking trails in Big Bend National Park. The trails we have listed are only the ones that we’ve had a chance to put posts together for. Rest assured, we’re working on more. 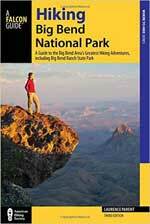 In the meantime, if you want a full guide to all of the hiking trails in Big Bend National Park, we recommend picking up a copy of Hiking Big Bend National Park on Amazon. It covers almost every trail in the park and easily fits into your pack. A copy of the National Geographic Trails Illustrated Map should also be in your pack.